Someone who will never need reminding about Taraffo’s lasting influence (see “Taraffo’s Infinite Influence” of last month) is my indefatigable octogenarian friend Franco Ghisalberti. 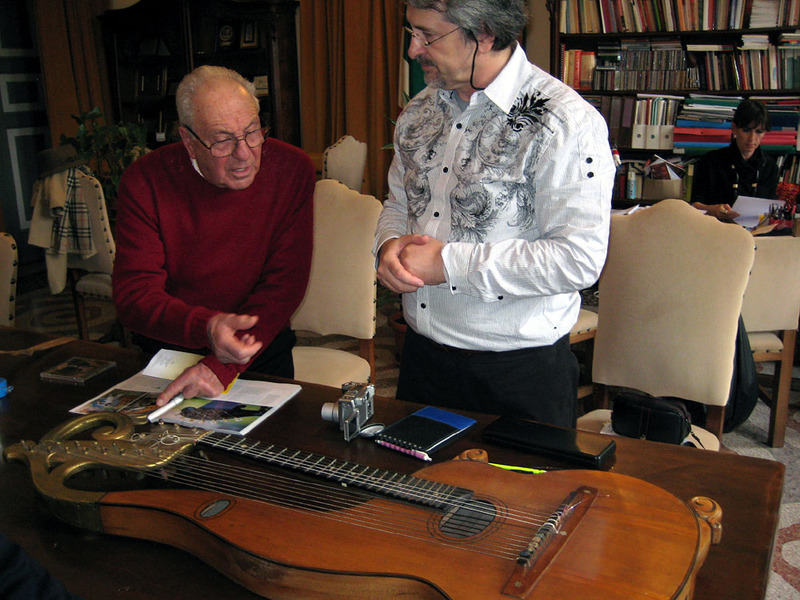 (Harp Guitar Gathering goers will recognize Franco [at left] as the living legend who signed my “Sir Gregory” knighthood document). Ever since Franco and I first connected in 2007, he has been a tireless harp guitar sleuth in Italy on our behalf. 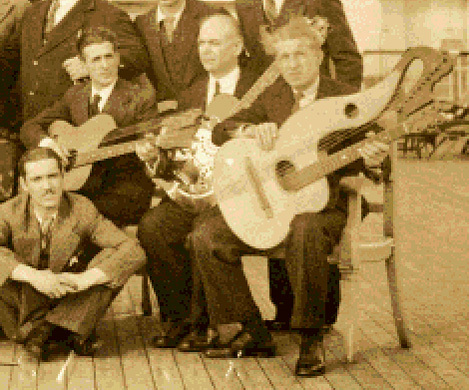 Besides all his invaluable Taraffo discoveries, he has unearthed countless new historical photos and instruments of other builders and players, each a rare piece of Genoese or broader Italian guitar history that might otherwise have never seen the light of day. His vast network of friends and colleagues are of course indispensable and all have our appreciation. 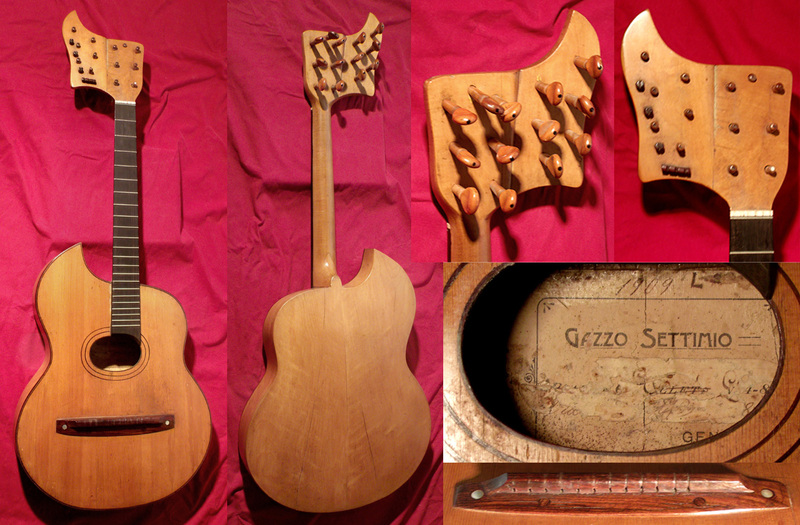 Antonello Saccu (at left, with two custom multi-neck instruments he just completed) has discovered an instrument by yet another unknown Genoese luthier. 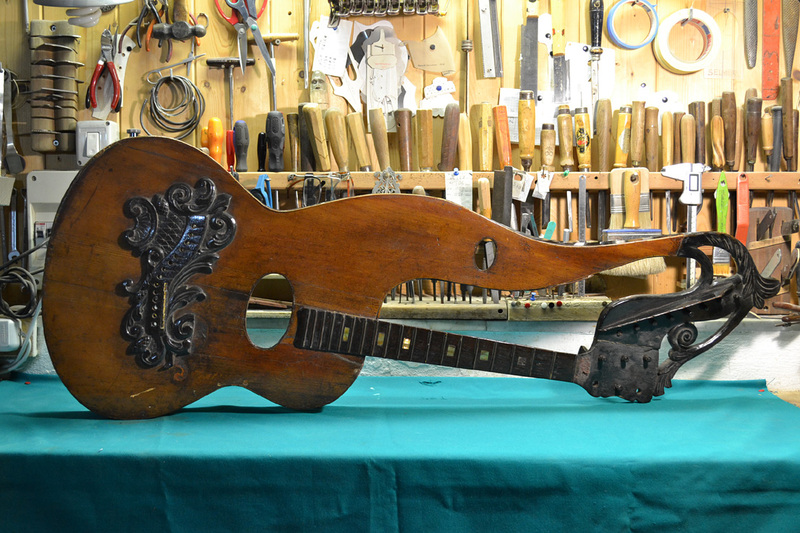 This one seems to have been inspired by both Taraffo and the Candi brother luthiers – and has taken “overly ornate bridge real estate” to a new extreme! The insides look a mess, but Antonello loves these challenges. 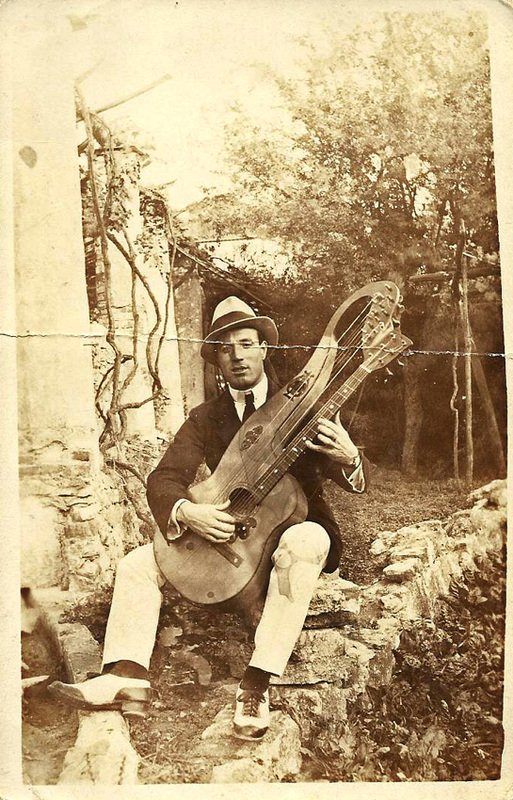 Antonello – who regularly haunts the Genoese flea markets – also found this old photo and new image of an unidentified guitarist and his Taraffo/Gazzo-inspired harp guitar, similarly-unidentified. Franco himself still manages to locate new Gazzo specimens. He recently purchased this 1909 6-bass theorboed model. 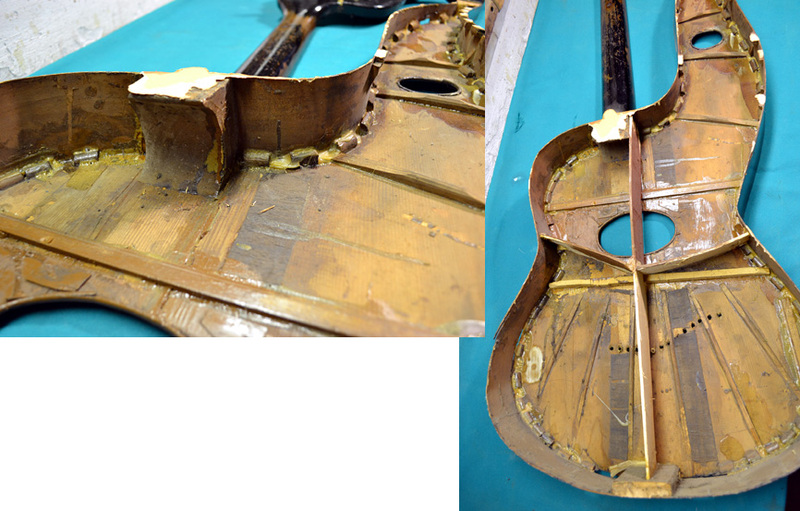 The 7th tuner for the neck seems to be only a “spare” stuck in the hole normally used for wall hanging. It has some pretty random and busy nut post placement for those subs, doesn’t it? 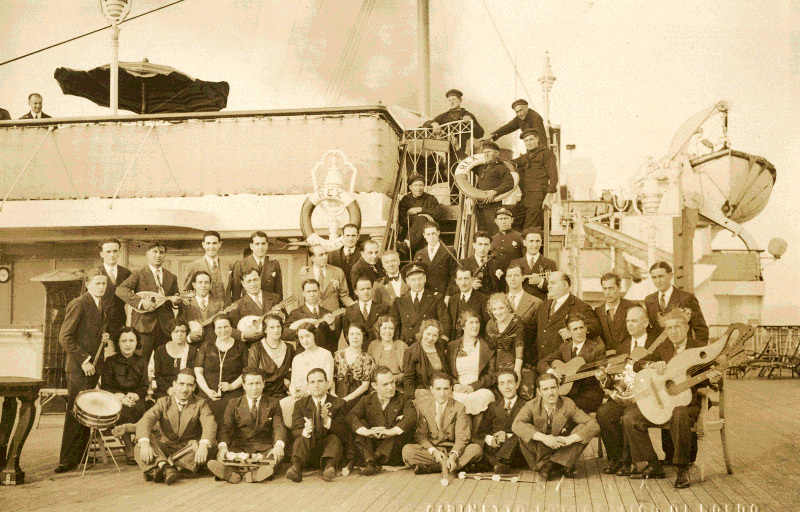 In the photo below discovered by Franco, two unknown Genoese harp guitars appear with other string instruments in a portion of the ship orchestra of the “Rex,” which before the war was the country’s flagship.